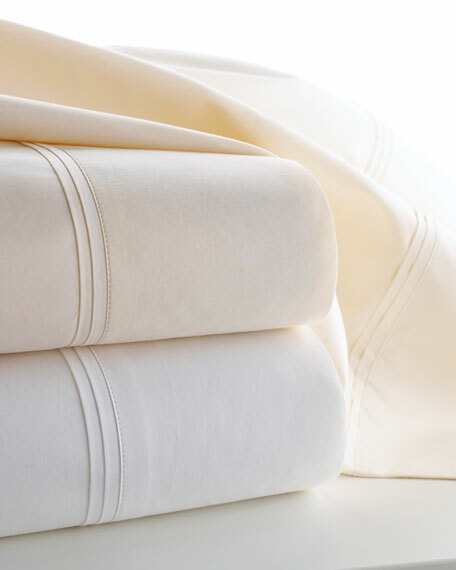 Solid percale pillowcases are woven of silky-smooth, long-staple cotton and finished with double-pleat percale trim. The son of a jeweler, John Matouk understood the principles of fine workmanship and quality materials. After studying fine fabrics in Italy, he founded Matouk in 1929 as a source for fine bed and bath linens. Today, the third generation of the Matouk family guides the company, whose headquarters were relocated to the United States from Europe during World War II. Matouk linens are prized worldwide for their uncompromising quality and hand-finished detailing by skilled craftsmen.